This article is about race courses from the Mario Kart series. For similar-looking race courses from Mario Kart Arcade GP and Mario Kart Arcade GP 2, see Rainbow Coaster and Rainbow Downhill. For the course from Super Mario 64, see Rainbow Ride. For the stage in Super Smash Bros. Melee and Super Smash Bros. Brawl, see Rainbow Cruise. Rainbow Road is the final course of the Special Cup featured in all Mario Kart games and is the climactic course of each game it appears. As the name suggests, these tracks are made of rainbow-colored glass or metallic surfaces that are either one color or change their color as racers pass by them, depending on the game they appear in. Most of them are transparent throughout the Mario Kart series. They typically appear floating in deep space or atmosphere, although the one in Mario Kart: Double Dash!! and the remade N64 Rainbow Road and SNES Rainbow Road in Mario Kart 8 hang suspended in a starry night sky above a landscape. Most contain few or no railings, putting racers at risk of falling into space, and each Rainbow Road also contains its unique hazards. Due to these obstacles, Rainbow Road is among the difficult courses in each Mario Kart game. Starting in Mario Kart 7, some of the Rainbow Road courses have some sections of the race track that are not rainbow-colored. Rainbow Road is also usually a long track when compared to other tracks. Outside the Mario Kart series, Rainbow Road has also made some appearances in other games. also makes an appearance in F-Zero X. Towers floating over the clouds, where the Rainbow Road takes place, depicted in Mario Hoops 3-on-3. Rainbow Road is the unlockable third dribble race from the "challenges" section in the basketball game Mario Hoops 3-on-3. 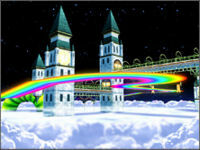 However, this Rainbow Road floats above the clouds and around a clock tower, and not much of the course is fully seen when playing. Rainbow Road in Super Mario Galaxy 2. In Super Mario Galaxy 2, Rainbow Road appears in the Rolling Coaster Galaxy in the mission called the "Rainbow Road Roll", and also a purple coin challenge, but it is very different than in its previous appearances. While it does retain its appearance, it's curved and appears to be made up of rainbow tiles instead of the colors simply being contiguous, much like the Rainbow Road from Super Mario Kart in which the track was also made up of rainbow tiles. Instead of just the Rainbow itself, it also has several platforms shaped both like mushrooms and squares with different colors. Despite taking place in space, this Rainbow Road features a cloudy sky as a background. Along the way, Mario or Luigi must avoid several obstacles like towers and Bob-ombs. Also, the two brothers can earn two Power Stars for finishing the course, one for the normal mission, and another for collecting 100 of the 110 Purple Coins. The music played when riding on Rainbow Road is a remix of the music played on the The Princess's Secret Slide in Super Mario 64. The Rainbow Road stage, from Super Smash Bros. for Nintendo 3DS. 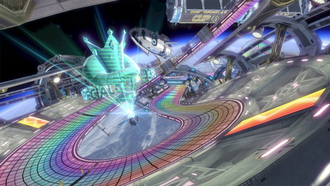 Rainbow Road appears as a stage for Super Smash Bros. for Nintendo 3DS, taking the appearance of its Mario Kart 7 incarnation. Like Port Town Aero Dive from Super Smash Bros. Brawl, it is a cruise-type stage where players fight on a platform that flies around the course, which also occasionally lands on the course itself. While on the ground, Shy Guys can drive by and damage any fighters in its way, like in the Mario Circuit stage from the previous game. A Rainbow Road (with the racers driving karts from Mario Kart 8) also appears in Rosalina's announcement trailer, where Mario, Luigi, Peach, Bowser, and Donkey Kong are all racing each other only to be suddenly interrupted by Kirby on his Warp Star, followed by Rosalina and a Luma. This Rainbow Road does not appear in-game, though, but it takes a slight resemblance to the DS rendition. Rainbow Road as it appears in Paper Mario: Color Splash. Rainbow Road played an important role in Paper Mario: Color Splash, as it led directly to Black Bowser's Castle. The road was formed after all six Big Paint Stars were retrieved. Luigi drives Mario and Huey over to Black Bowser's Castle via his kart. Eventually, all but Huey (who elected to stay behind to ensure the black paint could not seep into the ocean when Black Bowser's Castle falls down) escaped the castle and returned to the road. While comforting Mario about Huey's decision, Luigi indicated that he knows Huey will probably be back as promised as "Luigi has fallen off Rainbow Road more times than Luigi can count." Starting from Mario Kart: Double Dash! !, the surface on each Rainbow Road (including the retro ones in Mario Kart 7 and Mario Kart 8 / Mario Kart 8 Deluxe) creates a unique metallic "glistening" sound when racers drift or sharp turn on them. F-Zero GX also has a track similar to Rainbow Road called "Phantom Road", that does not take place in a starry night sky or the deep space like most Rainbow Roads, but rather in a psychedelic cybernetic void. In addition, the track has only one color that constantly shifts through the color spectrum as opposed to having the traditional rainbow-looking appearance. Earlier builds of the track that remain in F-Zero AX retain the Rainbow Road moniker, most likely as a nod to its predecessor. This page was last edited on March 20, 2019, at 16:24.